South Dean Terrance Roberts frequently sits students down who have had conflict and uses mediation practices to resolve the issue. 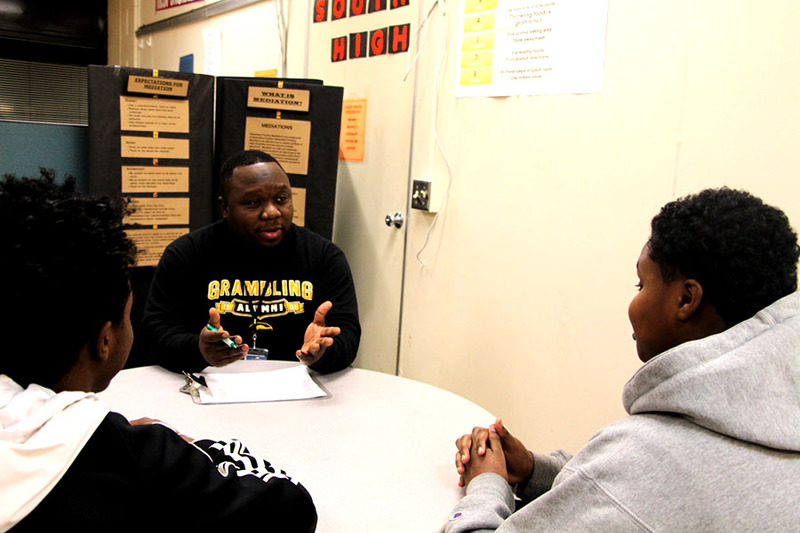 “We try to sit students down and get their sides of the story by [having them] write a statement .... we hear one side and the other side and we come to a consensus with some agreements.” Roberts is one of the few staff at South who has been trained in restorative justice practices. However, restorative justice needs to be implemented throughout the district more fully and intentionally. In light of recent school shootings, many are talking about how to prevent gun violence in schools. In this context, it’s also important to consider the best approaches for schools to prevent common acts of violence or conflict. Instead of the old-school practices of discipline, suspension, or other punitive practices, a different model should be utilized: restorative justice. Fully implementing restorative justice in schools will help students involved in conflict learn from their mistakes, take responsibility for their actions, and overall make students and staff feel safer. Restorative justice is a way to resolve conflict or behavioral issues that focuses on rehabilitation, mediation, and giving back to the community. It asks students to think about how their behavior affects others, make apologies, and resolve conflict by having mediation with those directly affected by the conflict as well as the broader community. Punishment, in contrast, is solely about blaming students for their actions instead of trying to understand students’ perspectives and helping them become better people. “I think [restorative justice is] more of a positive approach to help students make decisions about their behavior, whereas with negative reinforcement there’s really no attention given to why it’s a bad choice; just that it was a bad choice,” said Open social studies teacher Josh Fisher. Overall, South has done a good job implementing restorative practices. As a result there have been fewer suspensions, less bullying, and a safer community in recent years. “There’s more of an attempt to reconcile between teachers or students when there are conflicts…[and] have a conversation instead of a blanket punishment,” said Fisher. The current district policy surrounding behavior encourages each MPS school to have at least a few staff trained in restorative justice who use mediation practices to solve conflict and lower suspension rates, but there is no clear district requirement for a certain number of staff to be trained in restorative justice or a certain level of education in restorative practice for the whole school. In fact, many schools depend on School Resource Officers (SROs) hired from the police department to de-escalate situations. There are currently not policies in place requiring SROs to be trained in restorative practice. Additionally, behavior policies aren’t monitored that closely at individual schools. “At different schools there’s always been [so many] suspensions, and when you suspend students they’re not learning nothing at home for three days,” said Roberts. If restorative justice is commonplace in schools, it will set a precedent for these types practices to be used more broadly in the U.S. It will help curb everyday violence, police brutality, and mass incarceration. It could help prevent tragedies like mass shootings, instead of stopping this violence with more violence and fear. If we want to live in a country with fewer guns and more conversations, restorative justice is an essential first step.